As one of the few tuckpointing options under $200, Bosch gives you excellent performance for your tuckpointing tasks. Most people consider the expression “set in stone” to mean something is permanent or immovable. But the masons among us might have a different perspective since we spend much of our time repairing things that have been set in stone! Brickwork is a common example. Those mortar joints deteriorate, make a wall unsightly, and allow bricks to become loose. Today, I have one of the tool options used to rake out the old joints for repointing prep: the Bosch 5-Inch Angle Grinder with Tuckpointing Guard. You may have seen this tool on the job because it’s been around for few years. But with the increased regulatory scrutiny of respirable silica dust, it’s a good time to take another look at the tool. Let’s get to work. A fine repointing job depends on well-raked joints. The Bosch 5-Inch Angle Grinder with Tuckpointing Guard handles the task well, and its sub-$200 price tag makes it an attractive option that benefits from Bosch quality. I had just the job for the Bosch 5-Inch Angle Grinder with Tuckpointing Guard. A home’s old, brittle mortar had decayed so badly that bricks had come loose. I wouldn’t have been surprised if a leak had formed around the window. It was all “no bueno”. So, instead of using a raking bar or some such tool, I plugged in the Bosch, hooked up the dust collector, and started grinding away. The mortar was so old that I didn’t need a diamond blade; the included abrasive wheel worked out just fine. The Bosch 5-Inch Angle Grinder with Tuckpointing Guard’s features offer some obvious benefits, but I’ll point them out anyway. First, you can assure a consistent raking depth. 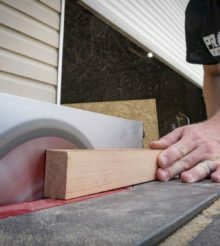 A blade guard adjustment makes changing the depth easy and quick. There’s a clear window in the guard that gives you good visibility of your work. I didn’t feel a lot of vibration, either. The dust shroud also kept the air clear. In short, you can fire up the grinder and glide along the joint. Changing the blade is nearly as easy as adjusting it. Just swivel the guard open for access to the blade. The sole oddity of the Bosch 5-Inch Angle Grinder with Tuckpointing Guard is the guard’s flange. It doesn’t sit flush with the rest of the surface. This allows some small debris to escape the shroud. I must note that this isn’t dust; it’s bigger and not breathable. It’s not a very big deal, but it gives you a legitimate reason to wear eye protection. If the guard sits closer to the brick, less stuff would escape. For a reason I can’t explain, there seems to be less of this debris when I turned the grinder over. Of course, this isn’t optimal ergonomically – and it turns the dust shroud and hose upward in an awkward way. Obviously, there are more options, but that’s a pretty good spread of the price range and power you can expect. Bosch sits in a very good position with their 10-amp motor and sub-$200 price tag. Where are these made (i.e. country of origin)? I’m in the market for an angle grinder but I refuse to support slavery if at all possible and it’s very difficult for me to find out where stuff is made.